June 16, 2017 – Border Police Staff-Sergeant Major Hadas Malka was stabbed to death at her post outside the Damascus Gate in the Old City of Jerusalem. Hadas Malka, 23, of Moshav Givat Ezer in central Israel, died of wounds sustained in a terrorist attack on Friday evening (16 June 2017) outside the Old City of Jerusalem’s Damascus Gate. 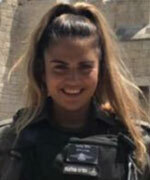 Malka started her mandatory military service in the navy but later transferred to the Border Police, extending her mandatory service by 15 months in the process, after deciding she wanted to protect Jerusalem from terrorists. Hadas was critically injured in the stabbing attack on Friday evening. She was transferred to Hadassah Hospital Mount Scopus in Jerusalem where she underwent emergency surgery but later succumbed to her injuries. Thousands attended her funeral, which took place in a cemetery in Ashdod shortly after midnight on Saturday 17 June. Among those who came to pay their respects, along with family and friends, were senior police officers, Cabinet members and MKs. Malka, who was promoted posthumously to the rank of Staff-Sergeant Major, is survived by her parents, three sisters and two brothers.